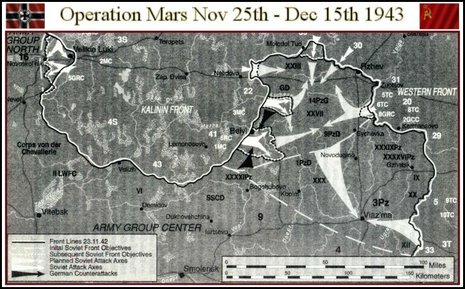 Operation Mars was the operation codename for the Rzhev offensive operation part of the Rzhev-Vyazma strategic offensive operation (08.01-20.04.42) launched by Soviet forces against German forces during World War II. It took place between 25 November-20 December, 1942 in a salient in the vicinity of Moscow. The offensive was one in a series of particularly bloody engagements collectively known as the Battles of Rzhev, which occurred near Rzhev, Sychevka, Vyazma (Sychevsk-Vyazma offensive operation) between January 1942 and March 1943. The battles became known as the "Rzhev meat grinder" ("Ржевская мясорубка") for their huge losses, particularly on the Soviet side. 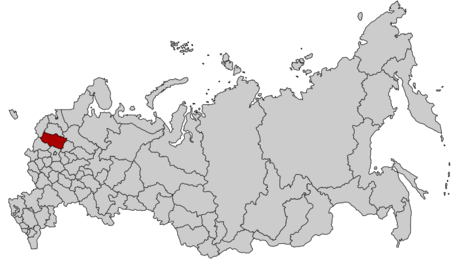 Other operations that were executed as part of the strategic offensive were the Mozhaisk-Vyazma offensive operation (Operation Jupiter), Toropets–Kholm Offensive and the Vyazma airborne desant operation. 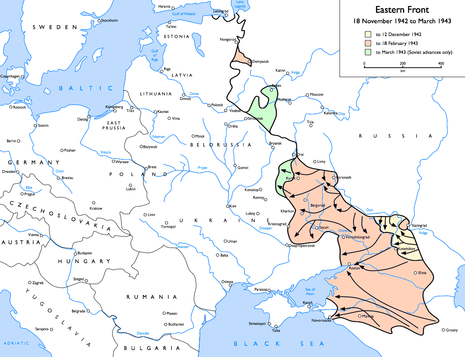 The offensive was a joint operation of the Soviet Western Front and Kalinin Front coordinated by Georgy Zhukov. For many years it was virtually unknown in the West, and just relegated to a footnote in Soviet military history. The basic plan of the offensive was to eliminate the Rzhev salient by launching multiple, coordinated thrusts from all sides of the salient. After the destruction of the German 9th Army, the forces would regroup and link up with the 5th and 33rd Armies which were to attack along the Moscow-Viaz`ma highway. This latter part of the operation was codenamed Operation Jupiter. When resistance around Viaz`ma was neutralized, the 9th and 10th tank corps and the 3rd Tank Army would then penetrate deeper into the rear of Army Group Centre. However, the American historian David Glantz considers that the offensive was more important in STAVKA planning than the near-simultaneous Operation Uranus, and its minimisation into a mere holding attack supporting the Stalingrad operation was a propagandistic whitewash. He claims that the plan was to develop it into a breakout for Army Group Center's deep rear. Operation Mars: Initial forces 668,000 men and 2000 tanks, plus 415,000 men and 1265 tanks earmarked for the follow-up offensive Operation Jupiter ( about 150,000 men and several hundred tanks were used to reinforce the unsuccessful Op Mars). Operation Uranus ( initial Stalingrad offensive): 700,000 men and 1400 tanks, plus 400,000 men and 1200 tanks for the second part named Operation Saturn. The losses (as stated below) also compares quite unfavorably with those suffered during the Stalingrad offensives: 155,000 killed/missing and 331,000 wounded over a period of almost two and a half months. It would have not been the only instance in which the Soviet armed forces downplayed and ignored unsuccessful operations, while emphasizing the successful ones (they would not be the only country doing this). Especially as Zhukov would go on to gain fame as one of the most able of the major Soviet military commanders, it would make sense to obliterate his occasional blunders. In the words of author David Glantz : "In the unlikely event that Zhukov was correct and Mars was really a diversion, there has never been one so ambitious, so large, so clumsily executed, or so costly"
With the German summer offensive stalled in the ruins of Stalingrad and on the slopes of the Caucasus Mountains, STAVKA sought to regain the strategic initiative on the Eastern Front. Operation Mars was to be executed in unison with Operation Uranus, the code name for the Stalingrad counteroffensive. Named after the Roman God of War, Operation Mars formed the centrepiece of Russian strategic designs in the autumn of 1942.